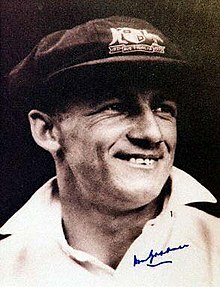 ↑ "Sir Donald Bradman player profile", Cricinfo, अन्तिम पहुँच २००८-०५-१८, "Sir Donald Bradman of Australia was, beyond any argument, the greatest batsman who ever lived and the greatest cricketer of the 20th century. Only WG Grace, in the formative years of the game, even remotely matched his status as a player." ↑ Hutchins, Brett (2002). Don Bradman: Challenging the Myth. Cambridge University Press. प॰ 21. .